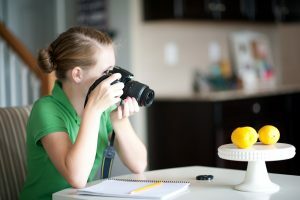 Elective courses, like our online middle school photography class, allow students to develop their interests and skills. In the middle school program all core subjects are combined into three main programs, Leadership, Humanities, and STEM. Math is included as part of the STEM program. In addition to these core subjects, we offer electives that help students gain skills or knowledge in other areas they might find helpful as they approach their high school years. To learn more about any of the electives we offer, click on the elective name to read specific details about the course framework for each course and guiding questions that are covered within the course. Which electives should my student take? We typically recommend that students enrolled for the first time in a full load of classes select no more than one elective for their first semester. This allows students to find the right school/extracurricular/life balance without experiencing significant overwhelm. If you are considering enrolling your student in more than one elective or are trying to decide which elective your student should take, contact us and we’ll be happy to help you find the best enrollment option for your student.